It’s been an undeniably rough year, but at least we had some brilliant advertising along the way to inspire, amuse and delight us. Adweek’s picks for the 10 best ads of 2016 are an extremely varied collection, from comedy to drama and everything in between. And they represent many of the year’s cultural touch points. There is the year’s best Super Bowl ad, the best Christmas ad and the best Olympic ad. There are celebrity directors (Wes Anderson and Spike Jonze) and celebrity stars (including Taylor Swift and Michael Phelps, who bookend our selections). There’s a Nike blockbuster, though it’s not from the U.S. There’s a shocking PSA, though while it’s about school shootings, it’s not about gun control. There are also several masterpieces of craft, from a stunning set piece cleverly designed to air around the presidential debates to the latest incredible brand partnership from OK Go. Congratulations to all the agencies and brands here for making the year’s best work. Getting the world's biggest pop star in your ad is good. Having her sing another pop star's song, and fall flat on her face off a treadmill, is slapstick gold. In a year when Apple made generally good use of celebs, this spot stood out. It didn't hurt that it was shared first with Swift's 94 million Instagram followers. Man pushing himself to the limits. It's a hoary cliché of masculine advertising that's parodied mercilessly, and hilariously, in this Old Spice ad about a man who builds a rocket car and roars through the desert—with disastrous consequences. The meta snark is perfect, and proof this P&G brand can still bring the funny. OK Go has worked with many brands on music videos, but few as brilliant as this. The band filmed 4.2 seconds of colorful stuff exploding—paint buckets, water balloons, even guitars—and slowed it down to a four-minute video, cleverly integrating Morton Salt and its "Walk Her Walk" charity initiative along the way. Spike Jonze returned to adland in wonderfully weird style with this four-minute perfume ad, featuring Margaret Qualley spasming to the beat of her mutant brain, and shooting laserbeams out of her fingers. Echoing Jonze's own "Weapon of Choice" video for Fatboy Slim, it was nonetheless a bizarre and captivating sight all its own. The best ad on Super Bowl 50 was also its most stripped down. This quiet 60-second Jeep spot featured portraits of Jeep drivers—famous and not—with a simple, evocative voiceover celebrating the brand's 75th anniversary. Remarkably, it was a vertical video—which was perfect for mobile, and framed the photos beautifully on TV, too. Leave it to Wes Anderson to make the year's most delightful Christmas ad. A train is delayed in bad weather at the holidays, but the conductor (Adrien Brody) hatches an improbable plan to celebrate on board. The four-minute spot is a mini masterpiece of craft, with H&M fashions woven throughout and a surprisingly emotional ending. A simple, breezy love story, set inside a high school, had a breathtaking twist no one saw coming in this brilliant bit of misdirected storytelling from BBDO. No other ad this year left viewers quite so stunned. The spot didn't just tell you to look for warning signs before a tragedy—it made you miss them without even realizing it. Girls in India are told sport is a waste of time, and to focus on school and marital eligibility. This three-minute Nike spot—starring the ultimate squad of Indian women athletes (and other celebs)—was a freewheeling, joyous rebuke to that thinking. Marvelously conceived and shot, it was a stunning debut on the brand from W+K's Delhi office. Audi made a lot of great ads in 2016, but none as spectacularly staged or gleefully fun as "Duel," in which hotel valets—a man and a woman—did battle, entirely in reverse, for the right to park an RS 7. Great choreography, eye-popping stunts, perfect payoff—and a genius media buy around the three presidential debates. The brief was simple: Explore the rigors of training through the lens of Michael Phelps ahead of the Olympics in Rio. The finished spot was astonishing, using darkness to paradoxically shed new light on one of the planet's biggest stars—and the physical and psychological cost of dedicating one's life to swimming at the highest level. Check out our full story about the No. 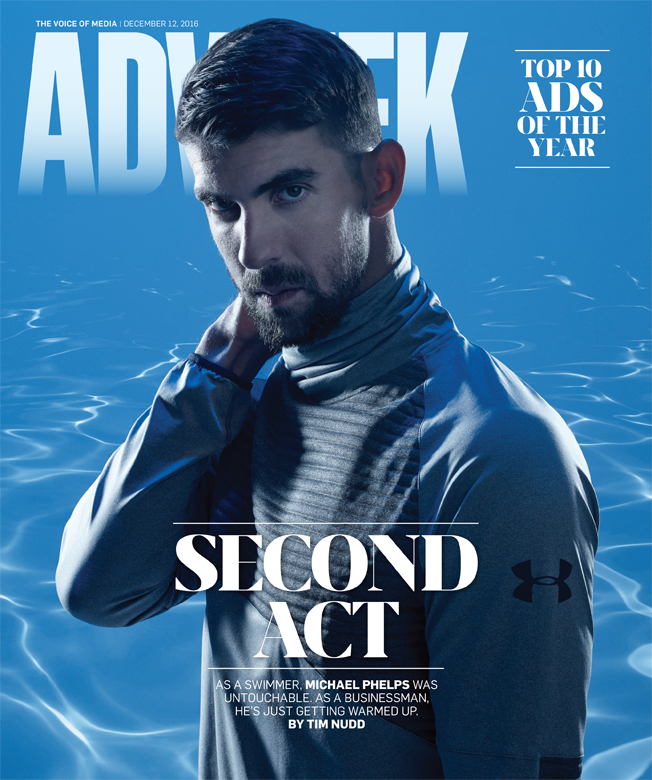 1 ad of 2016 and our profile on Michael Phelps. Credits for all 10 spots appear below. Courtesy Capitol Records Inc. and Kobalt Music Publishing America Inc. This story first appeared in the December 12, 2016 issue of Adweek magazine.